split, or stellate), and degree of stratification. Also of diagnostic value is whether starch is found as solitary (simple) granules (Figures 7.16a-d) or compound aggregates of two or more granules that are flattened where they have common faces (Figure 7.16e). Starch is visible in preparations made with glycerol or unheated water and can be stained bluish black with iodine solution (Figure 7.16c). 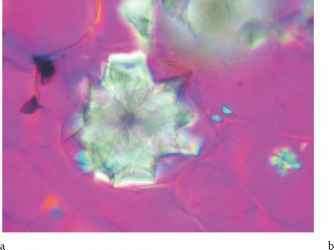 In polarized light, starch granules appear luminous with a black Maltese cross (Figure 7.16f); the center of the cross coincides with the position of the hilum. Different types of starch frequently occur in a single plant and analysts should pay attention to the fact that starchy grains such as rice, corn, or potato are often used as fillers for root or rhizome material. 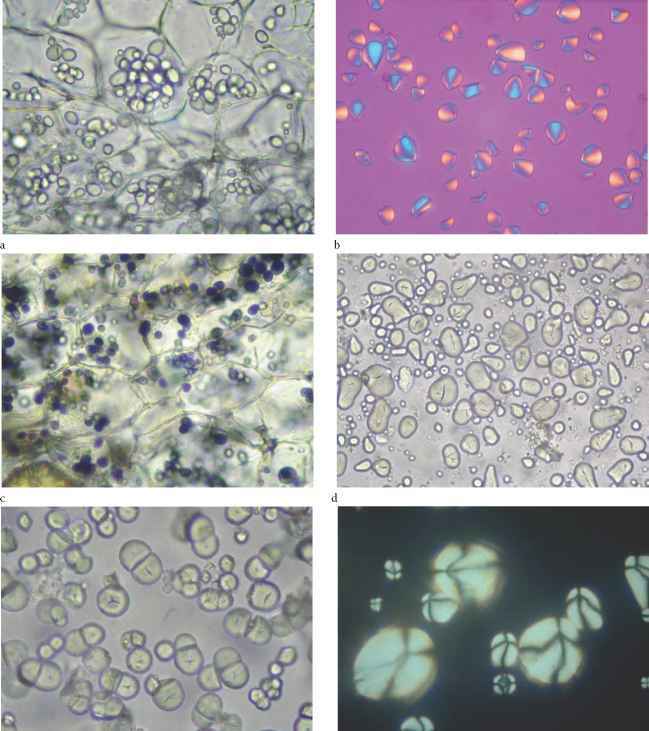 Each of these has characteristic types of starch grains that can be readily identified. glycerol. It stains yellow with picric acid and yellowish brown with iodine solution. Lipids and Fixed Oils Lipids appear microscopically as numerous spherical droplets of oil (Figure 7.17c and d). They are widely distributed throughout plant tissues but are most common in seeds and fruits (e.g., Aesculus hippocastanum, Echinacea purpurea cypsela) and flower petals. Very large amounts of oil can obscure cell contents and make microscopic examination impossible. When this occurs, percolation with apolar solvents can reduce oil content. Lipids will stain orange-red with Sudan IV (Figure 7.18c). Mucilage Mucilage is a polysaccharide that dissolves or swells in water but is insoluble in alcohol (e.g., Senna alexandrina pod, Symphytum officinale root). It is thought to function for water storage. Mucilage turns dark blue when stained with methylene blue solution (Figure 7.18a). FIGURE 7.16 Types of starch granules. 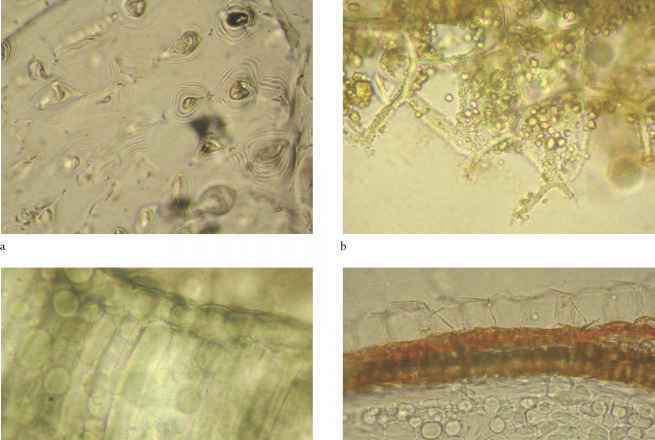 (a) Simple starch granules of Zingiber officinale root with an excentric hilum (transverse section); (b) simple starch granules of Zingiber officinale root (polarized light, compensator first order; transverse section); (c) simple starch granules of Zingiber officinale root stained with iodine (transverse section); (d) asymmetrical pointed starch granules of Stephania tetrandra root with central hilum (transverse section); (e) compound starch granules of Aesculus hippocastanum seed (transverse section); (f) starch granule of Solanum spp. showing Maltese cross (polarized light). (e.g., Achillea millefolium, Illicium verum, Matricaria recutita, Zingiber officinale). They generally consist of terpenes (monoterpenes, sesquiterpenes) and/or derivatives of phenylpropane. They are present as oil droplets and are soluble in alcohol, whereas lipids and fixed oils are generally poorly soluble in alcohol. Like lipids, volatile oils give an orange-red color in the presence of Sudan IV. Resins are also alcohol soluble and may be found with volatile oils or as irregular masses in secretory cavities or ducts (Figure 7.18b and c). Tannins Tannins are polyphenolic compounds that often have therapeutic value (e.g., Arctostaphylos uva-ursi leaf). They frequently occur in cell vacuoles and are soluble in water or alcohol; therefore, they will be visible only when dry material is sectioned. Tannins tend to oxidize and polymerize, in which case they become insoluble and are usually visible as reddish brown cell contents (Figure 7.18d and e). They give a blue-black or greenish black color with a dilute solution of ferric chloride. Found predominantly in seeds and fleshy underground organs such as beets (Beta vulgaris) or garlic bulb (Allium sativum). 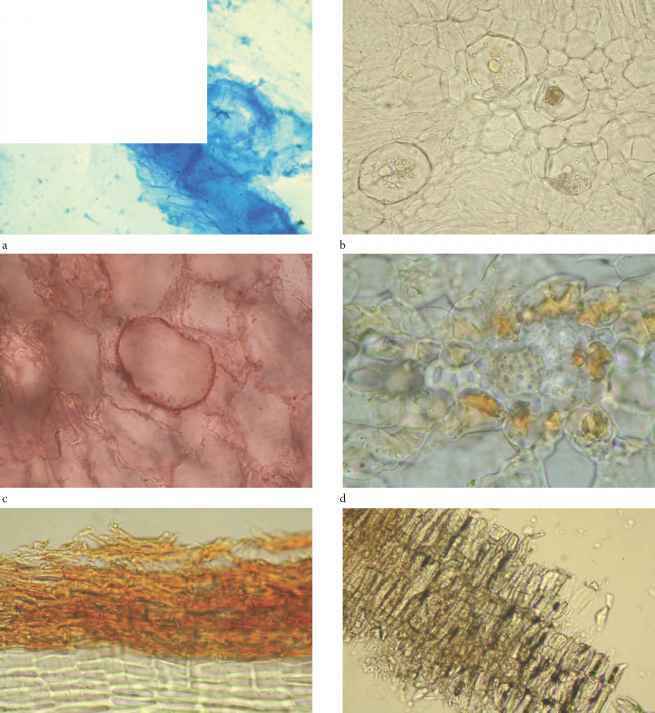 Diagnostically interesting storage substances contained within storage parenchyma include starch, lipids, oil, and protein bodies (aleurone) as described in text. Consists of irregular intercellular spaces, giving the appearance of a loose array of cells. This arrangement creates a large surface to aid in gas exchange and is typically found beneath leaf epidermal tissue having stomata, forming the mesophyll (assimilation tissue) of leaves. 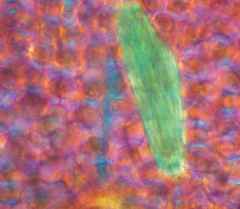 Specialized parenchyma that contains chloroplasts for photosynthesis. 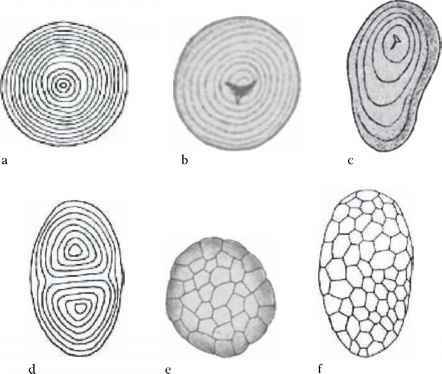 In leaves, the chlorenchyma is composed of one to several layers of cells just interior to the epidermis of the leaf. These cells are usually vertically elongated and rod shaped when viewed in transverse section and are called the palisade layers (Figure 7.19d). Large, regular, intercellular spaces that occur between groups of parenchyma cells that facilitate gas exchange within an organ. It is similar to spongy parenchyma, except that the intercellular spaces are obviously larger. In tissue with very large intercellular spaces, aerenchyma cells may have lobes or arms. 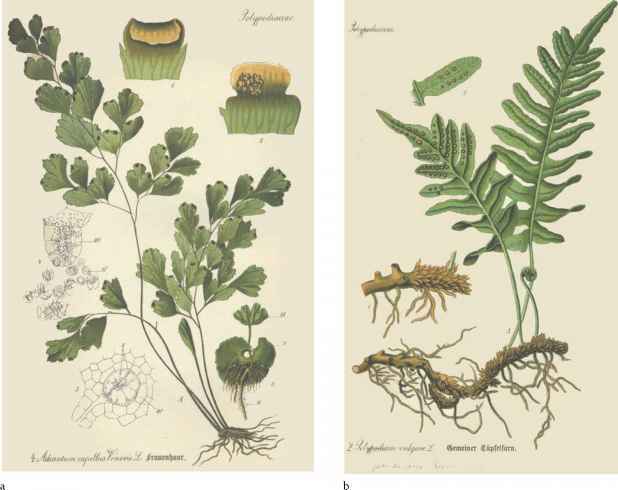 Aerenchyma is well developed in water plants or plants growing in moist soils (e.g., Tussilago farfara leaf) and is most often found in leaf mesophyll and submerged petioles and stems (Figure 7.19d). 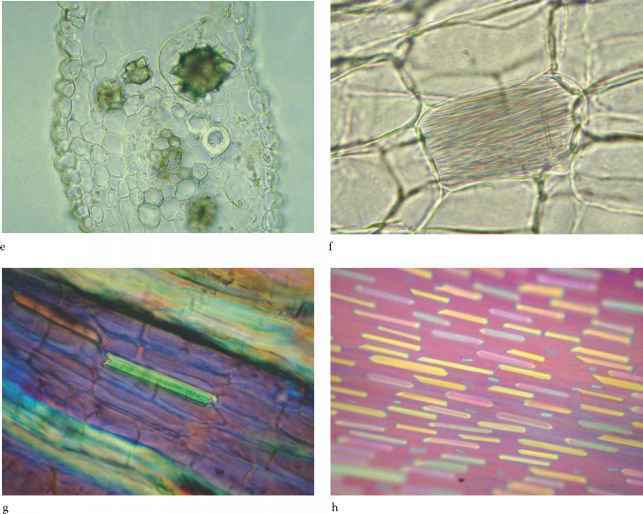 Found in the cortex of stems and roots; composed primarily of fairly round, axially elongated cells having small intercellular spaces (Figure 7.19e). Large, undifferentiated parenchyma cells that form the central pith in many stems and some roots (Figure 7.19f). The thin-walled pith parenchyma often tears as the plant organ expands with growth, resulting in a pith cavity. In some species, the cell walls are slightly thickened and pitted. Inulin Inulin (Figure 7.18f) is a polysaccharide that serves as the primary storage substance in the roots of members of the Asteraceae (e.g., Arctium lappa, Inula helenium, Saussurea costus), Campanulaceae (e.g., Codonopsis spp. ), and some monocotyledons. It is sparingly soluble in cold water, appearing as translucent, colorless, amorphous masses. Precipitation in alcohol gives it a more crystalline structure. 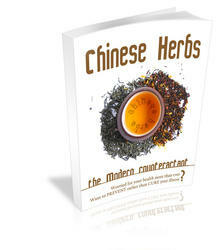 It is freely soluble in hot water or hot chloral hydrate solution. Is starch grains found in stramonium laef?